I've been wanting to share more food posts, since after all, the word "eat" is the first word of this blog! I'm starting off with a few of my current favorite Trader Joe's products. We are lucky to have a TJ's close by, but this particular store is quite an experience. It's three floors high, and it gets so crowded on Sundays that the line wraps around the entire store. You basically have to get your cart, go through the line (which moves pretty quickly) and grab whatever you can. Oh and the other shoppers are pushy and aggressive, because NYC. Not good for my anxiety levels. Anyway, we recently discovered that if you go during a super random time (like late Saturday night) it's much less crowded and you can actually spend time looking at all the food. So, here are some of my recently discovered favorites. These salad dressings rock my world! I usually make my own dressing at home because I'm afraid of all the weird ingredients lurking in the pre-made kind, not to mention the unnecessary added sugar. These are full of wholesome ingredients and contain only 2g of sugar per serving. 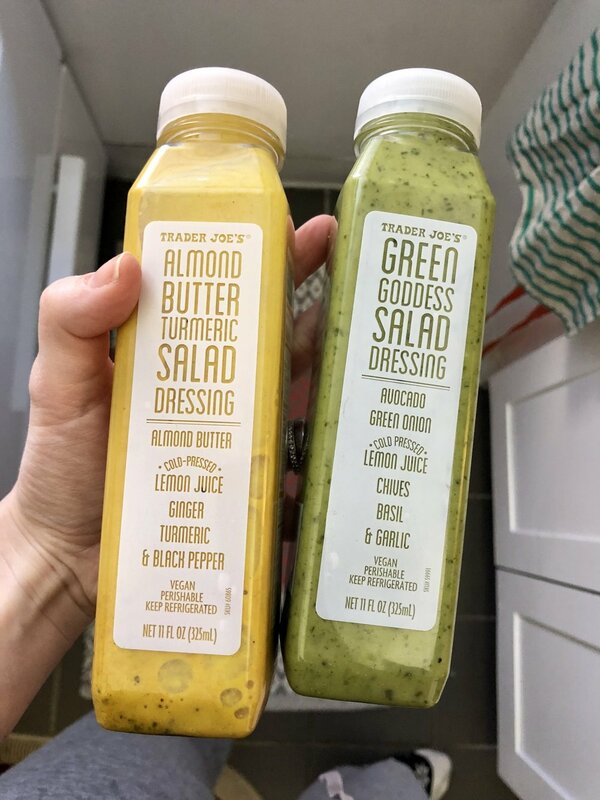 The Almond Butter Turmeric is awesome on a spinach salad or as a veggie dip, and I recently used the Green Goddess one to marinate a piece of fish. I'm sure it would be great for chicken or steak as well. There are few tasks in the kitchen that I enjoy less than the ordeal of cutting/peeling/chopping a whole butternut squash, so I always buy it already prepared. Throw these crinkle-cut butternut squash babies on a pan with some olive oil and S&P, roast for 25-30 min. on 400 degrees, and you sorta KINDA feel like you're eating French fries....OK maybe not quite, but they are still super tasty. I hear they are also great for getting kids to eat their veggies. Anyone tried them as a pasta swap, like the label suggests? So, forgot for a second what I said earlier about naughty ingredients, while we talk about this bread. This has been nicknamed "crack bread" by the internet. It's that damn good. It makes the most buttery and indulgent grilled cheeses, especially when dipped it into some creamy tomato soup. Stopppp itttt. And of course, the French toast. It's definitely not a weekly purchase in our household, but sometimes, you just have to live a little. These bad boys, on the other hand, are always on our weekly shopping list. These whole grain crisp breads are a healthy way to satisfy a craving for something crunchy, and they are basically a blank vehicle for whatever you want to pile on top. A few of my favorite combos: smoked salmon + cucumber, avocado + hard boiled egg, peanut butter + jelly. Move over quinoa! Farro has more protein per serving, is packed with heart health benefits, and in my opinion has a much more satisfying chewy texture. This kind is pre-cooked and boils much quicker. So go get yourself some and start throwing it in everything. Gather & Dine has a ton of seductive looking recipes for it, including this Kale and Farro Salad (for when you want to be healthy AF) and this Wild Mushroom Farro Risotto (for when you get that mid-winter slump comfort food craving). Stay tuned - as I discover more products during my lit Saturday nights at TJ's, I'll be sure to share them with you.